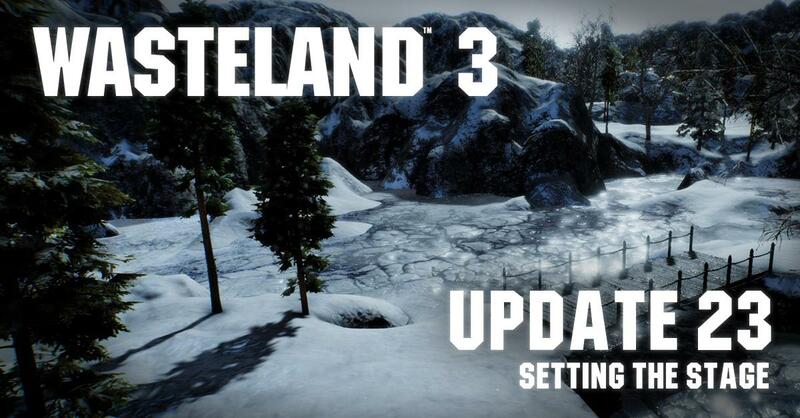 In this #Blocktober-themed update, the Wasteland 3 team takes a look at level design. This iteration process is common throughout all of our level design, and almost every area of the game undergoes these types of changes and refinements towards best realizing our gameplay. That Everest Exterior "work in progress" art is sweet. If that's representative of in-game visuals, it's going to be a nice looking game indeed. Yes, yes, nice. Still waiting for information on game mechanics. It's weird to get details on level design like "this ledge wasn't high enough to create the impression the hunters were really trapped", but not even basic information on party size, character system, combat system, etc. On the overall development progress: the Stanley Hotel is branded as the game's vertical slice prototype, and it doesn't look anywhere near finished yet. The game only officially began production in June. By comparison, D:OS 2 launched its Kickstarter with a largely bug-free prototype of the starter island that was handed out to streamers and previewers and had all major mechanical changes and additions in place, and it still took two years until release. Until inXile work faster and more efficiently than Larian, I would worry about the Q4 2019 release date. Not really, the two are pretty much orthogonal and probably not even handled by the same people. Since such sense of details is part of what makes the different between an ok game and a great game, it's nice to know they are doing it. But sure, I would also like to have more information about party size and character system, but I guess after the way people reacted to TTON cuts and health bar, they probably want to be 100% sure of their system before announcing it, so we'll have to wait... sad but logical consequence. Until inXile work faster and more efficiently than Larian, I would worry about the Q4 2019 release date. InXile missed the initial estimated release date on WL2 and TTON, I never had much faith into the Q4 2019 date even while the Fig was running so... but I'm fine with inXile taking their time, if it's what's needed to make great games. Wasteland 2’s rangers could use cover, flank their enemies, and attack from rooftops with deadly precision and horrific status effects. Wasteland 3 will build and polish this existing system while adding a new feature: team-focused abilities... By including vehicles, environmental dangers, and a revamped, more fluid action system, we are evolving on Wasteland 2's deep tactical turn-based combat and unique encounter design. So sounds like a similar style of combat system: turn based squad level tactical (use of cover, flanking, elevation, etc) but presumably with refinements (whatever "more fluid action system" means) and abilities we'll find out about when the game releases. It may be for the best for them to avoid too much detail when the game is still early in development. We'll see the details in the end. Hopefully they'll ship when they believe it's ready - that beats releasing something less polished just to make a deadline announced years before. At least that was answered nearly a year back. It still is the 4 + 3 party size. @Update: Yeah, nice read. I guess the REALLY interessting stuff won't come 2 years prior release. So I won't hold my breath for them. Yay! (I could live with other choices, but I liked 4+3 in WL2). The size of the forest level is good. They're supposed to get lost in the forest, so you need a level big enough to do that. It just _keeps going_. Oh gods, it's so picturesque. It's like a postcard. Perhaps that can be used in the level intro (like the street scene with the raider shadows were). It's beautiful and I hate it. (Nerds don't like the outdoors! ) Is this meant for the Xbox? It still is the 4 + 3 party size. Can you source this please? The developers haven't contradicted it after a week. First pass art by Erika Sass. Oh gods, it's so picturesque. It's like a postcard. If you click on enough things in the update, it leads to a larger version, here. I agree, it is very nice. The partially frozen pond makes it. A lot of the initial art is looking really nice. "Re: Wait. Is this a single-character game?? Hey guys, thanks for voicing your thoughts. However, you are reading too much into that interview. In Wasteland 3, we're still building on Wasteland 2's party-based system and giving you the ability to create and customize Rangers. The main difference is we're planning for you to start out as a single character, before forming a full party out of created characters and companions." I think there is no way they can sneak out of 4+3 party system, if they said the bold part. I hope you're right, but you are jumping to conclusions. Yeah, well aren't we all? I mean it is the same saying it it not 4+3 anymore just because Brian Fargo didn't post here something like "Ok, here you go. Just so that you can't come with any other conclusion: WL 3 has exactly the same party size like 1 and 2. Just the approach to create the group is a bit different." Hey, I'm not saying it is and I'm not saying it isn't. I'm saying it's not confirmed. Whered the Cassandra Khaw thread go? Was she lying about the job? Cassandra is indeed a writer on the project. I removed the post for a few reasons, not the least of which was it written a way that made it seem like an official inXile statement, which it wasn't. We'll be formally announcing Cassandra's involvement in a future backer update.